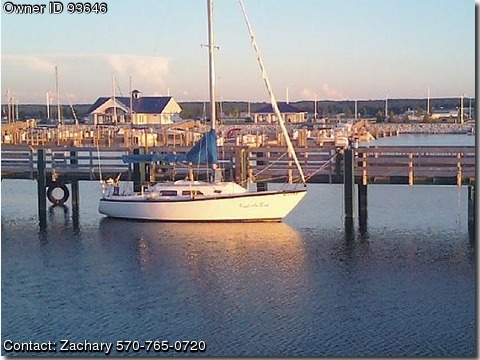 BOAT OWNER'S NOTES: Call Zachary @ 570-765-0720 My 29ft Ranger sailboat was shaped and molded in 1976. This is a great year for sailboats due to the thicker fiberglass hull than any sailboats after 1982. This Ranger, once known as "Jezabel", Now known as "Knot An Exit", has served me well for the past 4 years, I have sailed the great lakes and lived aboard her for these unforgetable many years, Her cabin is complete with two fresh water sinks, two burner alcohol stove, many built in lamps with multiple 110 watt outlets, plenty of storage space and a huge ice chest! The main cabin can sleep 3 but 2 comfortably, All the electronics work with a depth finder, gps and marine radio. The next section divided by a sliding door is the head, I have never used this system but I always kept it clean and winterized and is in pristine working order, A medicine cabinet is adjacent. The fore peak is where the main sleeping area is and can sleep 2 comfortably. If a dark room is what you call for to sleep closing the fore peak fold door is quite easy, Plenty of storage under the bed and also the fresh water tank. She is a strong yet gentle sailor, She has a rolling furlow with a 110, 130, 150, 160 north sails, Her spinnaker pole allows her to be super fast and stylish with the custom sail, Her main is tall and the shrouds are strong, She has a few custom cabin door inserts for all weather, And the brand new auto helm makes a day sail easy. The folding prop allowes her to be sleek in the water. Her atomic 4 engine runs perfect. I never had a problem with it and always had it professionally taken care of, I'm not sure exactly how many hours are on it, but I know not many, She likes the feel of wind so why turn on the engine. This boat means the world to me and I would not be selling her unless I had too. Other items include: 2 achors, one with 6 ft of chain link, Mini frig, 6 life jackets, Marine hand held radio, Dart board, Sail covers, 2 shore power cords, outlet covers, New bumpers, Replacement tiller, Grill, Pike pole, Radio with cassette player, Cleaning supplies, 2 good batteries.